One of the most enduring hallmarks of youth is a full, thick, lustrous head of hair through which one can run one's fingers. Hair expresses our personality and contributes to a unique expression of our identity. Unfortunately, the aging process as well as hormonal shifts and genetics can often lead to hair loss and hair thinning. This can be devastating to the appearance, causing self-consciousness and lowered self-esteem. For some, it may even cause depression and social anxiety. Thankfully there is an innovative solution available at Dr. Rapaport’s offices in New York City. Here at Dr. Rapaport’s office and Coolspa, we are proud to offer the innovative NeoGraft hair restoration technology. We know that hair restoration can have a huge impact on one’s daily interactions and self-confidence, and we fully believe that it should be a natural improvement that refreshes and enhances the appearance without being obvious. With the expertise of a board-certified plastic surgeon with over 25 years of experience in aesthetics, you can be sure you are getting the highest quality hair restoration available anywhere. Many individuals seeking hair restoration have encountered only the traditional “strip method” of hair replacement. The strip method is especially unappealing because of the the linear scar it leaves on the back of the head. In addition to potentially being visible despite hair growth around the scar, if hair in the region is ever shaved or lost the scar will be a tell-tale sign of hair transplantation. Fortunately, now there is NeoGraft®. We are excited and thrilled to announce that our expert Neograft technicians are now offering Neograft Hair Restoration in our New York office without the need to shave the donor site! They have refined their techniques and are able to offer Shaveless Neograft. 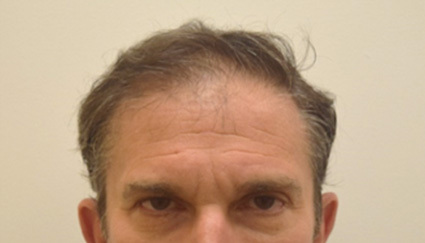 This technique is ideal for patients who simply cannot afford the downtime involved in waiting for the donor site (in the back of their head) to grow out. The technique is technically more demanding and requires a longer harvest period during the procedure. For this reason, the cost of Shaveless Neograft is greater than our traditional Neograft, which requires shaving the donor site on the day of the procedure. Dr. Rapaport is very excited to take advantage of this advancement and plans to schedule his Shaveless Neograft soon! when you call or contact us through our website to receive pricing too good to publish online! Hair follicles are where hair starts its growth process, from an area called the dermal papilla. Blood runs through the scalp, nourishing each hair root and making sure it receives enough nutrients. The first phase in hair growth, anagen, is the longest, lasting 7 to 8 years. The second phase is called catagen. This is a brief regressive stage, lasting only about three weeks. The next stage, telogen, is the resting phase. On the scalp, this typically lasts 3 or 4 months. In patients with male pattern baldness, the portions of the scalp become bald do so because the hair follicles of those areas have an inherited (genetic) sensitivity to a naturally occurring testosterone metabolite called DHT, dihydrotestosterone. Areas that have this sensitivity will over time develop finer and finer hairs that ultimately stop growing completely. Hair transplantation involves removing a percentage of the follicles from the parts of the scalp that are not sensitive to DHT, and therefore not thinning, and transplanting these follicles to the balding areas, 1 follicular unit (1, 2 or 3 hairs) at a time. 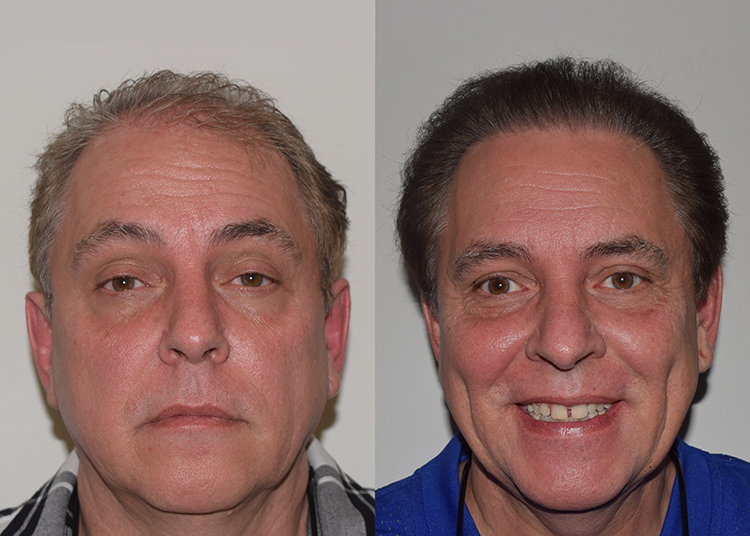 Dr. Rapaport is shown before and 6 months after his NeoGraft procedure. Flexibility to have any hairstyle afterwards, short or long- no linear scar to hide! Our NYC NeoGraft® delivers the most advanced technique of hair harvesting and implantation using the FUE technique. In fact, it is the first and only FDA cleared follicular unit harvesting and implantation system. Using the FUE system, complete individual hair follicles can be precisely extracted and immediately implanted into the scalp. It additionally employs the “no touch” technique, which increases the likelihood that the transplanted hairs will survive. NeoGraft® is the only system on the market that uses this no touch technique. The NeoGraft® Automated FUE is also a useful procedure to fix visible linear scars from previous “strip” surgeries. FUE can be used to ‘fill in’ or camouflage those old scars by transplanting new follicles into the area. We can also restore thinning eyebrows using NeoGraft®. Taking the first step forward towards addressing your hair loss can be daunting. Dr. Rapaport makes this experience easy and stress-free through a down to earth consultation process where he takes the time to answer all your questions and address any concerns that may arise. Additionally, Dr. Rapaport has extensive experience using NeoGraft and can supply you with a vast library of success stories as told through our before and after photographic library. Dr. Rapaport himself had the procedure performed in April of 2017, by his technician Tony Bernal, so he can share his personal experience. 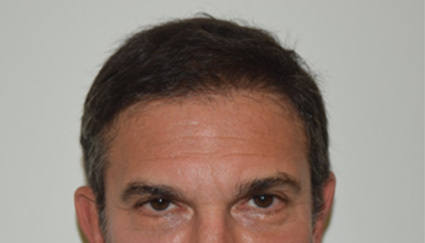 With over two decades of experience in facial cosmetic surgery, Dr. Rapaport is one of the most skilled and knowledgeable NYC experts when it comes to hair restoration. He is painstakingly detailed in his work, which leads to results that appear entirely natural and unforced. Many clients report that friends and family member comment on their improved appearance without actually being able to detect exactly where the changes are coming from. This seamless enhancement of the scalp is ideal, and is the hallmark of an excellent surgeon. "Over the past 2 years, I have personally observed the gentle approach, the exacting detail, and most importantly, the finessed results of Tony’s work. Selecting him to perform my own hair restoration was really a no-brainer. I have total confidence in Tony Bernal." Getting started is a simple process of scheduling your confidential consultation at Dr. Rapaport’s Manhattan offices. There you will meet with the doctor, a consummate cosmetic surgeon with extensive experience in the realm of facial aesthetics. The doctor will examine your scalp, review your medical history and prior attempts at hair restoration, and begin to develop a plan of improvement that caters to your unique lifestyle, wishes and anatomy. If you have any photos or images of your ideal hairstyle or hairline gleaned from magazines, this is a good opportunity to present them to the doctor so that he might better understand your goals for hair restoration. Communication is key during the consultation process, and is the foundation of successful surgical outcomes. All treatments are performed at Dr. Rapaport’s beautiful, fully-accredited outpatient facility. This onsite medical center boasts all the same advanced technology and cutting edge equipment as any local hospital, but provides patients with far more convenience, privacy and comfort. From our immaculate reception areas to our state of the art surgical suites, our accredited facility offers outstanding client care and results. Dr. Rapaport has assembled a team of credentialed and seasoned physicians, technicians and medical assistants who are on hand around the clock to ensure your safety and comfort. The majority of our NYC Neograft clients have the procedure while under oral sedation from medications such as Valium and Ativan. However, some patients, including Dr. Rapaport himself, prefer to have a more complete sense of relaxation as well as the assurance of virtually no memory of the entire event. For these clients, we offer intravenous sedation, also known as twilight anesthesia, provided by our Director of Anesthesia, Dr. John Grillo. With over 25 years experience, Dr. Grillo is a master of sedation techniques. Patients choosing IV sedation can be assured of a relaxing experience, and will likely have no recollection of any unpleasantness or discomfort. Recovery following this form of anesthesia is extremely smooth and rapid, further enhancing the overall experience.